BELIZE CITY, Thurs. 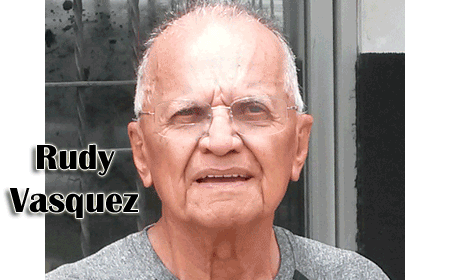 June 9, 2016–On a brief visit to the Jewel after being away for some 33 years is former well known Belize City football referee, Rudy Vasquez, who at 70 years is still an active, registered referee in San Bernadino, California, where he now resides. He says his officiating is now restricted to games below the U-19 level. Rudy was also once the Chairman of the Belize City Football Association back in the latter 1970’s, and, along with Vice-Chairman, friend and fellow referee, Daniel Edmonds, claimed the distinction of leaving some $10,000.00 in the association’s “kitty” at the end of their 1979 term, an unprecedented achievement in those days. Rudy said that he keeps in touch with Danny, who presently resides in Jamaica but has been ailing for some time. Rudy was a referee and a football executive during the exciting football decade of the 70’s in Belize City, and his visit to the Zinc Fence was a pleasant reconnection of sorts with Amandala publisher, Evan X Hyde, yours truly from the sports desk, and editor Russell Vellos, who were all intimately involved with football at that time. From among his memorabilia, Rudy left us a picture of the ASC (Amateur Sporting Club) team that participated in a tournament in Agua Dulce, Veracruz, back in 1972. Under the management of Hubert Bradley, the ASC team trained under Landivar’s Angus Vernon for the trip, and was “strengthened up” with some players from other teams, mainly Landivar, in the Belize City competition. Rudy leaves tomorrow, but says he will be back on another visit in September of this year. Big Up, brother Rudy Vasquez!